Charcot osteoarthropathy is a chronic progressive disease that can affect those that suffer from any type of peripheral neuropathy, but most commonly seen in the patients with diabetic peripheral neuropathy. Disease progression can lead to devastating consequences such as ulceration, decrease in quality of life, osteomyelitis, deformity and limb loss. Therefore, early recognition and conservative management are hallmarks in the treatment and prevention of the disease. A staple of management includes appropriate offloading with the goal of creating a stable, plantar grade foot. Even with conservative treatment, the disease progression may lead to surgery or amputation. We briefly review the etiology and literature on the surgical management of Charcot as well as present a case report regarding staged surgical intervention utilizing the Taylor Spatial Frame™. The hallmarks of management in the acute phase include reducing the inflammatory process by immobilization, to relieve pain, and to preserve the bony architecture of the foot. Initial treatment in the acute stage involves strict immobilization and offloading  although the gold standard of treatment is total contact casting. Other options include Unna’s boot with below the knee CAM Walker®, non-weightbearing and below the knee cast. It is important to remember that ulceration is not a contraindication to casting. However, casting should not be attempted in the presence of infection. With immobilization and offloading, most ulcers tend to heal. Care must be taken when casting to dorsiflex the foot with an unstable midfoot, instability or Lisfranc’s dislocation. Dorsiflexion at the level of midtarsal joint will increase the deformity and casting in this manner can furthermore progress the deformity. Rearfoot dorsiflexion can be difficult to achieve due to presence of significant equines contracture. If there is delay in diagnosis or the patient presents late, the disease process progresses; often rapidly. Surgical intervention is usually reserved for obstinate cases such as recurrent ulcerations, osteomyeletis, or when a deformity cannot be managed with bracing or custom shoe gear. Patients often present a challenge to the surgeon as they exhibit multiple co-morbidities. For example, patients can often present with signs and symptoms similar to a deep vein thrombosis (DVT), venous insufficiency or cellulitis. For this reason it is important to acquire a thorough history and physical in these patients, obtain the proper laboratory testing and keep a high index of suspicion for Charcot. This will necessitate sound recognition of the risks versus benefits of surgery. Many of these patients are misdiagnosed and are not properly treated. This ultimately leads to rapid foot break down, ulcers and infections of the bone and soft tissue structures due to inadequate care and misdiagnosis. A 70 year-old Caucasian male presented to a clinician at the Temple Foot and Ankle Institute with a chief concern of severe pain on the lateral aspect of the left foot and an ulcer on the medial plantar heel. The patient was previously being treated by an outside practitioner; where the culture and sensitivity revealed the presence of staphylococcus aureus. The patient’s medical history was significant for uncontrolled type-2 diabetes mellitus, hypertension, chronic back pain and osteoarthritis. The patient’s past family history, surgical history and social history were all unremarkable. Upon initial presentation, his review of systems revealed that the patient was mildly febrile with a temperature of 99.4°. A focused lower extremity examination revealed equinus contracture bilaterally and diffuse swelling of the left foot and ankle. Collapsed medial arches of the left foot along with plantar bony prominences were noted. There was severe pain reported in the left foot. An ulcer with the dimension of 6 x 4 cm was located on the lateral aspect of the calcaneus, a granular wound base and mild serosanguinous drainage was observed. Manual muscle testing revealed no deficits. Protective sensation and vibratory sensation were both absent bilaterally upon examination with Semmes-Weinstein 5.07 monofilament and a tuning fork respectively. Capillary refill time was normal. However, his dorsalis pedis pulses and posterior tibial pulses of the left foot were non palpable due to edema but were obtained using a pulse Doppler. Skin temperature and edema of the left foot was significantly increased compared to the contralateral limb. Initial radiographic examination of the left foot was negative for osteomyelitis, but revealed minimal mid-tarsal joint collapse along with a possible fracture at the base of the 2nd metatarsal. Extensive soft tissue edema of the entire left foot and left lower extremity, along with osteopenic bone was noted. The Meary’s angle of the left foot was mildly increased to 0.9°. The patient was diagnosed with cellulitis by the evaluating physician at that time and was dismissed from the clinic with prescription for Bactrim® and a Multi Podis® offloading-boot. 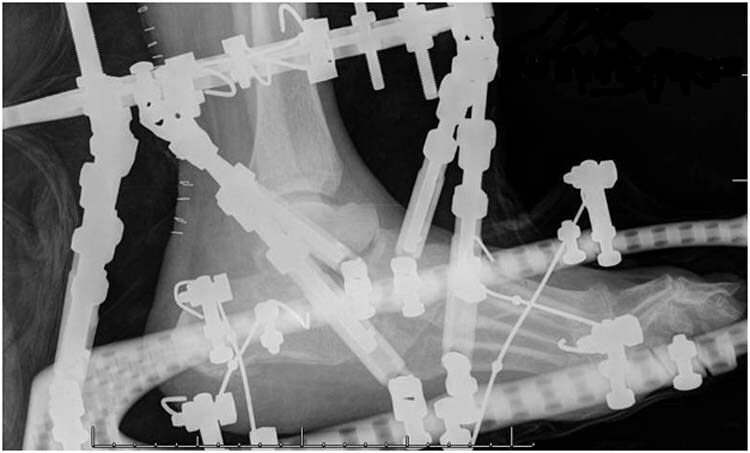 Upon his return to clinic approximately 2 months later, he was evaluated by the primary author, and radiographs revealed sub-talar joint dislocation, along with a progression of Meary’s angle to 18.4° and an extensive calcaneal varum deformity of 13.5°. Note that the Meary’s angle is the most reliable radiographic measurement that can be used to note the progression of the midfoot Charcot arthropathy. An Magnetic Resonance Imaging (MRI) was then performed and showed extensive marrow edema of the hindfoot bones with fragmentation compatible with Charcot deformity. MRI could not completely exclude osteomyelitis at the level of fibula and cuboid due to abnormal low marrow signal, but the overall appearance indicated reactive edema. At this point, further microbiology testing revealed that there was a strong presence of Group B beta-hemolytic streptococcus. The patient was then switched to a course of clindamycin instead of Bactrim®. Approximately 3 months after his initial presentation and failure of all conservative treatment options, including casting, offloading, and CAM Walker®, surgical intervention was then discussed with the patient and his family. The patient then elected to undergo staged surgical correction for Charcot deformity. The surgical procedure proposed included realigning the STJ utilizing the Taylor Spatial Frame™ followed by beaming of the rearfoot and forefoot in more anatomical position. The corrected position was assessed radiographically using the Meary’s angle and Calcaneal axial angle. Surgical intervention was planned once the ulcer was healed in order to decrease the risk of bone infection. Upon administration of general anesthesia and use of an ipsilateral pneumatic thigh tourniquet, the patient’s lower extremity was prepped and draped in sterile fashion and attention was initially drawn to the equinus contracture. A Hoke percutaneous tendo- Achilles lengthening was then performed paying particular attention to the medial aspect of the leg. A C-arm was utilized to identify the cuboid, and a trephine was then utilized to obtain a bone specimen of the cuboid to rule out osteomyelitis. The sample was sent for microbiology and pathology for further evaluation which later revealed bone necrosis but no osteomyelitis. Next, medial and lateral incisions were made along the level of the subtalar joint (STJ) extending from the distal aspect of the fibula and medial malleolus in order to visualize the subtalar joint. The calcaneus was noted to be subluxed and positioned lateral to the talus intraoperatively. After the release of the subtalar joint, the incision site was primarily closed. This concluded the STJ release portion of the procedure, and following this a partial tendo-Achilles lengthening was performed. Focus was then given to the tibial fixation. Two 155mm full and 155m long foot rings, part of the Taylor Spatial Frame (TSF), were placed on the midshaft of the tibia and another on the distal aspect of the tibia utilizing crossed smooth K-wire in orthogonal fashion. The rings were connected to each other by three threaded rods. 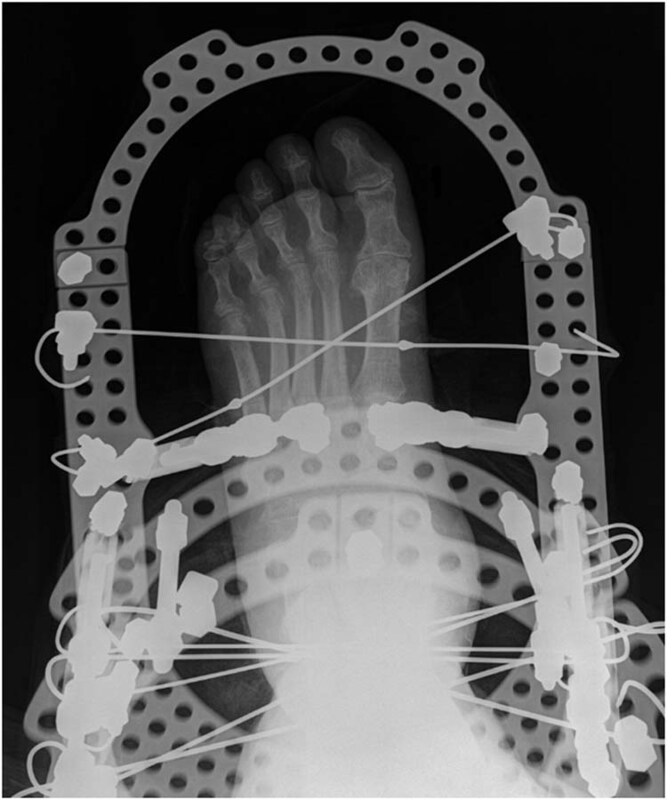 Application of the foot plate was performed attaching the foot plate to the heel and the metatarsals using two crossing olive wires on each points of fixation. Appropriate tensions were applied to all crossing wires according to their site of fixation to prevent any excessive movement of the device. Six TSF struts were added to the total configuration which extended from the distal tibial ring to the footplate. Following the application of the device, the STJ was distracted with proper visualization under C-arm to correct the medial calcaneal varus and to distract the STJ to its proper length. This was done using the TSF struts. Intra-operative and postoperative radiographs demonstrate that some significant distraction was achieved. Next a stirrup wire was added to the frame. It is important to utilize the stirrup wire technique when doing any type of distraction procedure with the TSF to prevent any pain created from the tension of the device. In this case the stirrup wire is inserted into the talar neck directly under fluoroscopy utilizing the lateral view and the wire is then attached to the proximal tibial ring. No tension is required when inserting the stirrup wire. This was to allow distraction of the STJ specifically without distracting the ankle joints or any other joints proximally. This also reduces pressure and tension on the proximal and distal wires and prevents unnecessary bending of these wires. The patient was then given a TSF prescription which outlines daily strut management. It allows 1mm movement on all of the struts to allow distraction and correction of varus deformity in a slow and progressive manner. X-rays were taken during each visit afterwards to appreciate the distraction and correction of the translational and varus deformity as noted previously. This was noted via Meary’s angle which went from 18.4°, eventually progressing to 2.1°. The patient was prophylaxed for DVT and was discharged uneventfully after a brief hospital stay. He then returned to the clinic weekly thereafter for dressing changes and management, and thus the postoperative course for the first staged intervention was uneventful. The patient returned to the operating room at 12 weeks, after finishing two course of the TSF prescription, for removal of the frame, and to undergo a triple arthrodesis and midfoot fusion with beaming. Following administration of general anesthesia and application of a pneumatic thigh tourniquet, bone marrow aspiration utilizing the Ignite system allowed for collection of 6 cc of bone marrow aspirate at the proximal medial tibia. The existing pins were removed, showing no signs of infection or purulent drainage, followed by the removal of the TSF. Postoperatively, it was approximated that there was 0-5* degrees of valgus of the hindfoot and forefoot was neutral to the rearfoot. The patient had no complications and went on to have an unremarkable postoperative course. To date, the patient is 1 year postoperative, ambulating, and is without complications (Figures 1, 2, 3, 4, 5 and 6). Figure 1 Preoperative anteroposterior and medial oblique radiographs showing severe talar head dislocation. 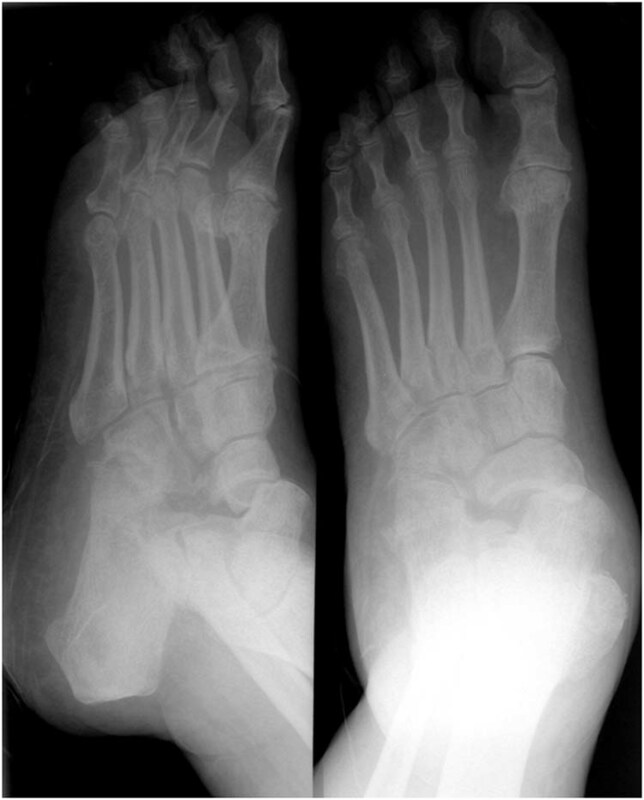 Figure 2 Preoperative lateral radiograph showing midfoot collapse. Figure 5 Three months postoperatively, the anteroposterior and medial oblique radiographs show arthrodesis with medial and lateral column beaming. 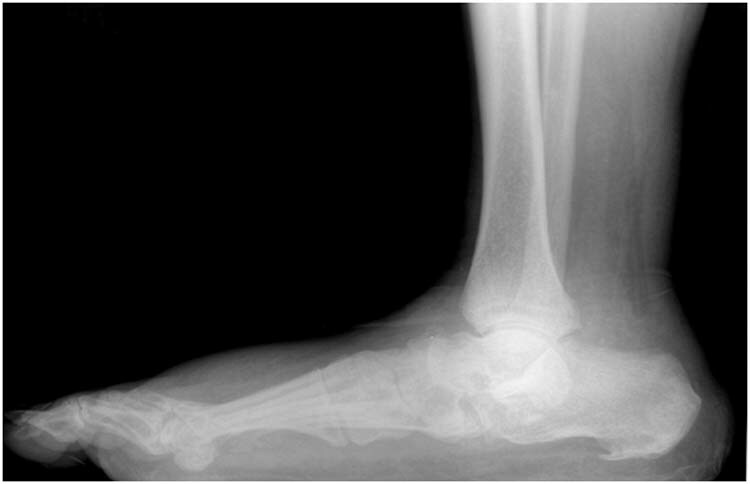 Figure 6 Three month postoperative lateral radiograph showing arthrodesis and beaming allowing for a stable, plantigrade foot. The patient was seen with no pain to the left foot and ankle. He had excellent dorsiflexion and plantarflexion. His only complaint at this time was heel pain. Upon clinical examination it was noted that the foot was in plantigrade position and there were no increase in temperature. His gait was noted to be calcaneal gait. The patient presented with diabetic shoes and he has been going through physical therapy. It was discussed with the patient that his gait was calcaneus gait. He had limited plantarflexion which limited push-off and put more force on his heel. Gel pads were dispensed for further comfort. X-rays showed no bony changes and complete consolidation of the areas. He has had no ulceration since the procedures. The areas corresponding with the screw insertion were asymptomatic. While comparative studies of external versus internal fixation remain elusive in the treatment of CO deformity, anecdotal literature does exist in regards to correction of foot and ankle deformity utilizing the Ilizarov frame. 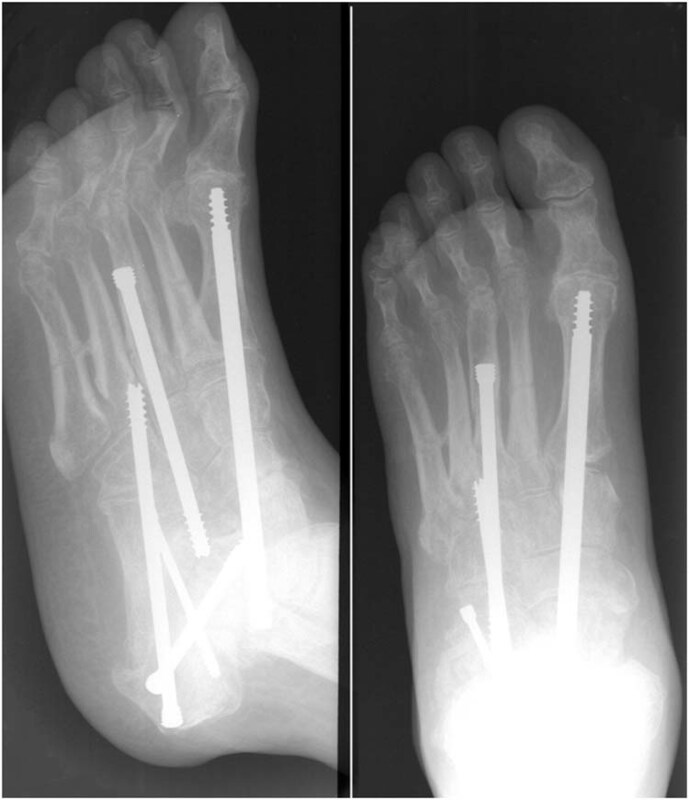 El-Gafary, et al., reported that arthrodesis controlled by Ilizarov frame was a successful means of achieving a stable, plantigrade foot in 20 patients studied.17 In a non-peer reviewed retrospective of 100 CO patients managed with the Ilizarov frame, Cooper found a 96% salvage rate, with only 5 developing CO on the ipsilateral side after removal of the initial frame, and 2 resulting in a BKA. 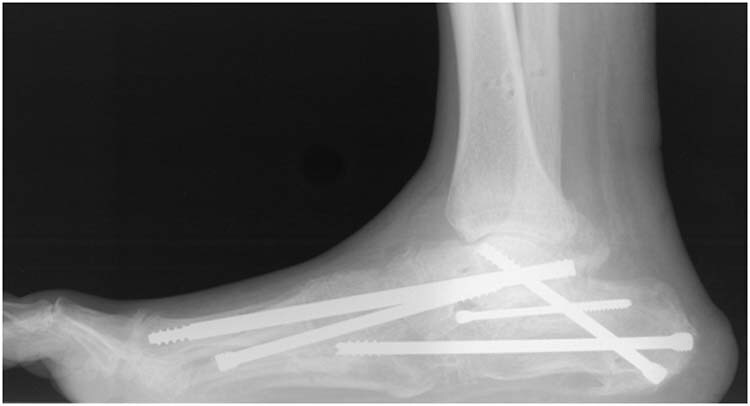 The Ilizarov frame demonstrates efficacy, but is not without its share of complications including but not limited to pin-tract infections, skin necrosis, osteomyelitis and hardware failure. The Taylor Spatial Frame™ as a surgical modality is also not without its complications such as hardware failure, pin tract infections, fractures, skin necrosis and operator error. Successful application of the TSF involves appropriate deformity planning, familiarity with the TSF software and additional training. Patient compliance is also an essential factor to a successful outcome. Appropriate judgment as well as sound knowledge and application of surgical modalities are vital for treatment of advanced stages of CO. Application of external and internal fixation described here are the surgeon’s preference in the management of progressive and unstable CO. It is known that the number of patients with diabetes is increasing, and with that, we can expect that there will be rise in reported CO. Recently, an international taskforce of experts on Charcot agreed that surgical management could be considered a primary treatment modality due to the common failures of non-surgical management Thus far, the data has been inconclusive in terms of determining whether one form of fixation (internal, external or combined) is better than the other. Despite numerous studies and increasing knowledge of the pathogenesis and management of Charcot, it remains a complex and challenging syndrome for the foot and ankle surgeon to treat successfully. The TSF is another modality, which despite lacking evidence-based studies in the treatment of Charcot, can be added to the foot and ankle surgeon’s armament in the management of this difficult condition. 2. Jordan WR. Neuritic manifestations in diabetes mellitus. Arch Intern Med 1936 57: 307-366. 10. Eichenholtz SN. Charcot Joints. Springfield, IL. Charles C Thomas, 1966. 15. Zgonis et al. Surgical Management of the unstable diabetic Charcot deformity using the Taylor spatial frame. Clin Podiatr Med Surg 2006 2: 467-483. 17. El-Gafary et al. The Management of Charcot joint disease affecting the ankle and foot by arthrodesis controlled by an Ilizarov frame. JBJS 2009 91B: 1322-1325.